Today’s post is a guest post from Dawn Karr. I know her as Mrs. Karr – she was my biology teacher in junior high school. I have been able to keep in touch and follow her story, thanks to social media, and how she has evolved into a runner. I asked her to share her story knowing that many people may be able to connect on some level. Over the years, Dawn has had to overcome obstacles both physically and mentally and she is truly an inspiration. You never know what you’re capable of until you try something new and resolve never to give up. It all started innocently. I was reading Christopher McDougall’s book Born to Run to get information for an anatomy and physiology class that I was teaching. I had always hated running and I only ran when I was forced to by a P.E. teacher. When I started reading, I was an overweight 43 year old, a colon cancer survivor, and a high school biology teacher who regularly suffered from stress-induced migraines. I remember saying to my friend who loaned me the book, “Just watch, this will make me want to be a runner!” And then, I laughed, knowing that it would take more than a book to get me to run! I finished reading over Christmas break in 2012, but I had already decided to give running a try. My only goal at that point was to love it. In January 2013, I mapped out a 1.1 mile loop, but when I started, I could only run a few blocks at a time. I would run as far as I could and then walk until I could breathe again and then run some more. I kept it up until I could run the entire 1.1 miles. Having read the book that started the barefoot running craze, I started running on the front of my foot; my heel never touches the ground when I run. I did not need to relearn how to run, since I had never been a runner. I started with transitional shoes, not traditional cushioned running shoes. (I now wear minimalist running shoes.) I loved the way I felt when I ran. I felt strong and healthy and invincible. And I loved running! Goal accomplished! 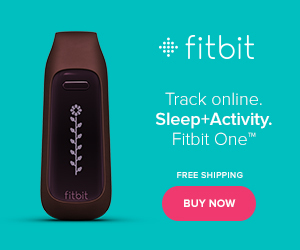 Once I was regularly running 1.1 miles and feeling good, I started increasing my distance. (I ran 3-4 times a week.) I only increased by about a quarter of a mile and then I would run that distance until I felt comfortable and confident before I increased again. By summer, I was running 3 miles five times a week. “I am a runner because I run. I am learning to be content with forward progress and to enjoy the journey, literally and figuratively. I wish I could say that my diet changed and my weight changed. Neither is true. I am a full time working mom and wife. At the end of the day, my goal is to get in a run and get my husband and son fed. I usually feed us whatever is most convenient and relatively healthy. My goal for this summer is more fruits and veggies for all of us! I ran my first 5K race in October followed by two more with Sisterhood of the Shrinking Jeans. In May, I ran the Colorado Marathon 10K and I am now training for a half marathon next spring. 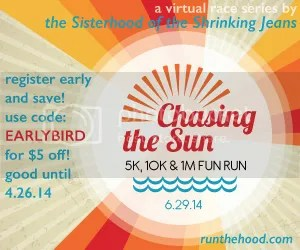 I’ll be running the Chasing the Sun 10K this month! I still love to run and that is still my number one goal…to love it. Running is the one completely selfish thing I do. How has my life changed in the last year and a half that I have been running? My blood pressure is lower and I have fewer migraines and I have runner’s legs. J Running gives me time to process intense emotions and I am a much happier person when I run. I am closer to God since running gives me time to pray. I feel better about myself. I found something that I love to do that is good for me in so many ways. No wonder there are so many running addicts out there…count me among them! What an inspiration to women everywhere! Way to go!! I love it! I just finished that book and it gave me a brand new outlook. I’ve been a runner for a few years now but I always said that I was too slow to really be called a runner. But after reading that book, it really it about the run, and nothing else. Great job!